I just adore Ol' Bessie to pieces. As soon as I saw her I knew I HAD to have her. Once I got her though it took me awhile to figure out where I was going to display her. My original idea was in the top area of our hutch in the dining room. Then I decided she needed a job. 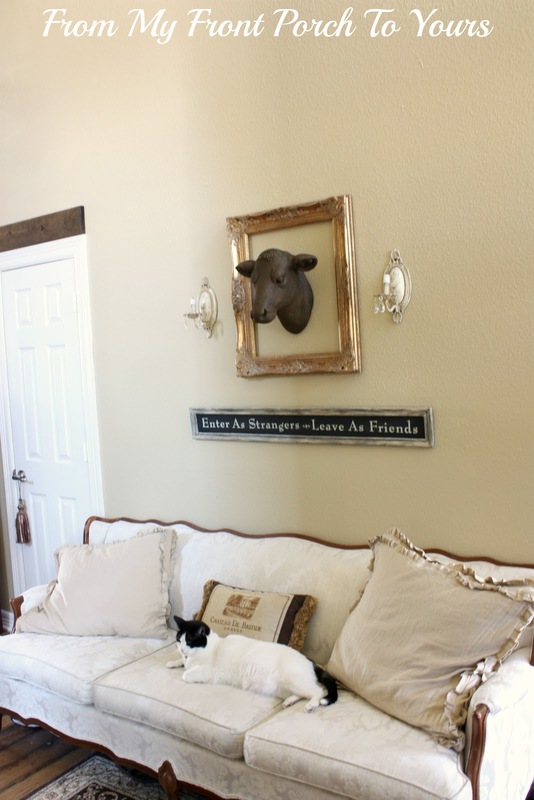 We live in Texas and what is better than a good old cow greeting ya when you walk in to a home!? I think Ol' Bessie is liking her new home in our foyer. After the holidays she may end up in our dining room but for now we enjoy seeing her when we come home. Of course Max our GQ kitty had to get in on the picture taking action. In the mornings he hangs out here to tell the boys good bye on our way out the door to school. He will actually sit there till I get back and then he goes on about his day. His is such a sweetie. He is just now learning to stand up to his sister pup Miss Savannah. Oh my could she get him running. On another note look what I found at HomeGoods this week!! I fell in love instantly and they jumped right in my cart. I have been wanting some brown transfer wear plates fro a long time now and well I love bunnies so what is better than that? I purchased four of them and am hoping they will get a platter to match. If you are interested in some of your own here is the info. I tried hunting some down on the internet and all I found were some SUPER expensive ones on Ebay. Bessie looks great in her new home! I love your sofa too. It is beautiful! Bessie is looking good. I love the brown transferware. That looks like the perfect spot for 'Ol Bessie, & I really like your sign below! The plates are darling! Love those dishes, Pamela! I have got to go to Home Goods! I love brown and white transferware AND bunnies, too, so these are really calling out to me. I bought those dishes too. They were at Home Sense in Canada. Did you see the pheasant plates, deer serving bowl and deer salad plates? I love them too!!! Love old Bessie in the gold frame. I like Bessie, most unusual. Bit different from the usual stag head. I need a Home Sense in Scotland so I can get some of those goodies! What a perfect idea to display her! Wish I had purchased one too! Oh well maybe it will come back! Love that sign under her too! Very cute! I like how you placed her in an open frame like that. I agree that living in the south, a cow head fits right in! She looks wonderful! I just love her! 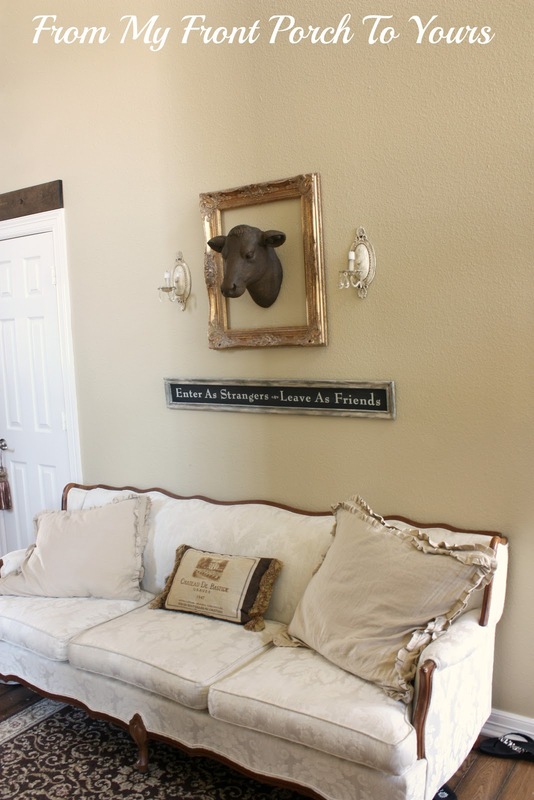 Great idea to hang her inside a frame! Love your plate!